In a second year of polling research commissioned by London Councils to gauge the public’s understanding of air quality and the effect it can have on their lives, 47 per cent of respondents felt that their health had been impacted by London’s air quality. Of those respondents, over two-thirds (68 per cent) said that poor air quality has led them to experience breathing difficulties. This figure has increased by 14 per cent compared to last year’s poll. 26 per cent reported that they suffered from breathing difficulties as a result of air pollution, which represents a 10 per cent increase compared to last year’s poll. Nearly half of people surveyed, 47 per cent, say that air quality affects their daily decisions regarding their own health. This figure has also increased by 8 per cent since last year’s poll. Fourteen per cent of respondents said that poor air quality had affected their children’s health. Londoners would be encouraged to buy an electric vehicle if they received incentives, with 36 per cent of those surveyed being encouraged by tax incentives and 31 per cent by an improved government funding grant. Over three quarters of respondents, 79 per cent, said they agreed that tackling air quality should be a priority issue, with 43 per cent strongly agreeing. 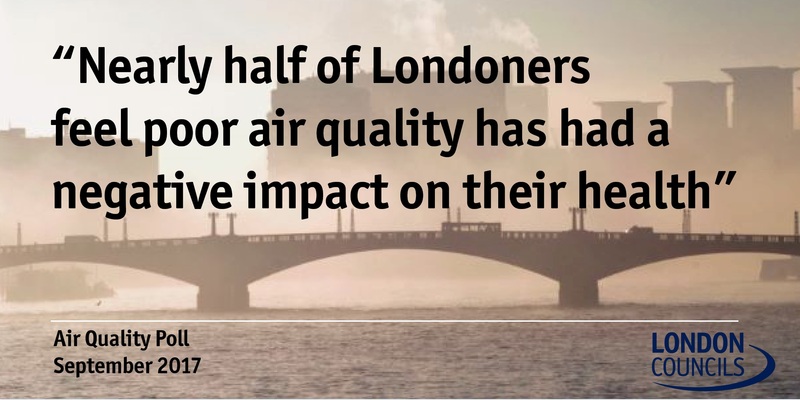 “This new polling data clearly illustrate that Londoners feel that the city’s air quality is not improving and that their health and that of their families is at risk as a result. It is incredibly worrying that people are experiencing breathing difficulties, which could have long-term consequences if not addressed. “This data further adds to evidence that our air pollution crisis is taking its toll on our lives. Air pollution effects everyone, hitting the most vulnerable the hardest, including the elderly, children and people with lung conditions. Consider introducing a new Clean Air Act so boroughs can gain governing powers to control sources of pollution outside of transport, such as generators. Ensure boroughs have the necessary funding to monitor air quality in their areas effectively. Introduce a carefully designed diesel scrappage scheme. Amend the fiscal incentives in place for purchasing vehicles. 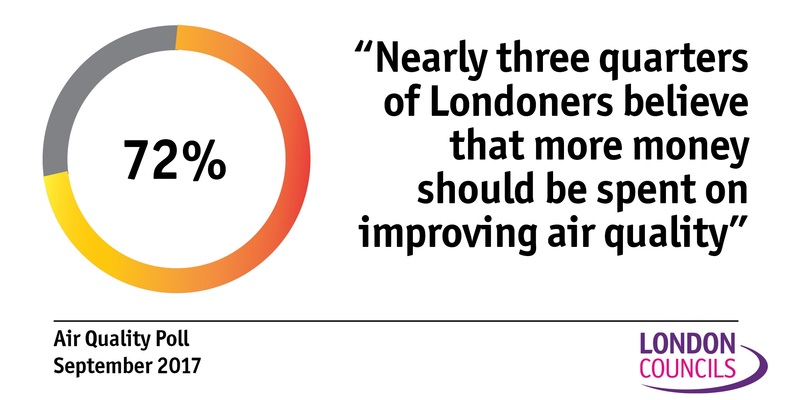 Nearly a third of all respondents felt that London’s air quality had got worse in the last 12 months. Nearly half of Londoners said there had been no change in the capital’s air quality in the last year. 47% of people said air quality impacted on decisions they made regarding their health, compared to 39% 12 months ago. Those most likely to say it impacts on their health decisions were those who cycle in London. Over a quarter of people (26%) say air quality affects their choice of school for their children. Over two fifths (41%) of people say air quality affects where they choose to live in London. People aged 16-44, as well those with children, and those in employment were more likely to say this. Over a third said air quality impacts on their travel decisions. This was highest amongst those who cycle, are in employment, parents, those who are aged 25-34, and those whose health is affected by air pollution. Islington Council is working with local businesses and organisations to improve air quality in Archway, a pollution hotspot. The Archway Zero Emission Network (ZEN) scheme works with businesses to reduce their emissions and make the area cleaner and healthier. Archway ZEN are working with 65 businesses, providing measures such as free trials of electric vehicles, free energy audits, delivery consolidation and grants to install measures to encourage active travel. Archway ZEN is also working with the Whittington Hospital in Archway; running anti-idling events for members of the public and staff, investigating electric vehicle charging points and training ambulance drivers. Islington Council is also working with a school in Archway to monitor local air pollution, produce low pollution walking maps and provide information on the sources and impacts of air pollution to pupils and parents. Islington has also focused a number of awareness raising measures in the area including Car Free Day and National Clean Air Day events. The cleanair4schools project has involved lessons with year 5 on pollution including: sources and solutions; how to identify it ( field trip to identify lichens); how to measure it (field trip to erect and later take down NO2 diffusion tubes); comparing main roads, playground and quiet roads/parks etc. Also a visit from theatre group on the Pollution Solution, assembly and parents evening talks to try and encourage modal shift – out of cars into walking, scootering, cycling along low pollution routes – identified by pupils – for AQ and health benefits. Richmond council conducted surveys to assess behavioural change which have been well received by staff, parents and pupils. Westminster City Council’s #DontBeIdle campaign, which calls for residents, businesses and visitors to sign a pledge to stop idling has attracted over 2000 supporters. The #DontBeIdle pledge encourage drivers to turn off their idling engines while at the side of the road, making a delivery or waiting for a passenger. As well as ordinary drivers - taxi, freight and delivery companies are all being asked to sign a pledge to reduce idling and help cut pollution. A car idling produces enough exhaust emissions, containing harmful chemicals every minute to fill 150 balloons and vehicles such as buses, taxis, vans, cars and delivery vehicles account for over half of the most deadly emissions in the air. There are some familiar faces among the 2,000 pledges with actor Nigel Havers, athlete Colin Jackson, F1 driver Valtteri Bottas, a number of MPs and government ministers including Jesse Norman and Thérèse Coffey all supporting the campaign. Last week alone 500 people signed the pledge and the local authority has a team of full time ‘air quality marshals’ running a series of road shows across some of the city’s busiest areas. Westminster suffers from amongst the worst air quality in the country with some of the most polluted roads in Europe. The #DontBeIdle campaign is one of a number of significant steps the council has taken to tackle the problem including introducing £80 fines for idling drivers and launching a pilot emissions based parking surcharge for diesel drivers. To date 15 fines have been issued for idling. Now the council wants government to create an air quality regulator to tighten up standards and give council’s further powers to tackle issues like idling.